Holiday knitting is in full swing at my house right now. I'm trying to stay motivated and get as much done now as I can before Thanksgiving and Christmas guests start arriving. Paulie's blanket is moving right along, and I'm more than half-way finished with it now. 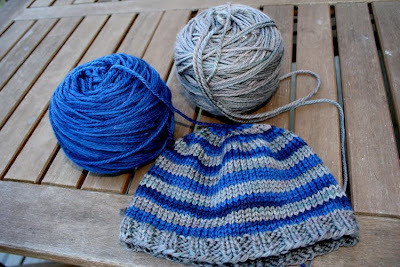 I also found this gorgeous Lorna's Laces hand-dyed superwash wool, in navy (which looks darker in actuality than the photo below) and pewter, to make matching, but not identical, hats for my nephews. One done, one to go! 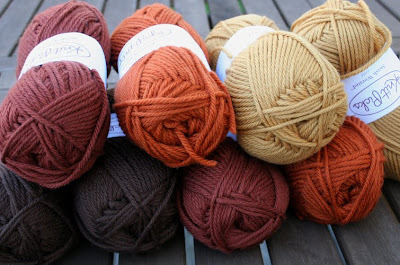 I also ordered some yarn from Knit Picks to make Elizabeth and Finn each a sweater. Elizabeth will be getting a sweater out of this hand-dyed Peruvian highland wool. 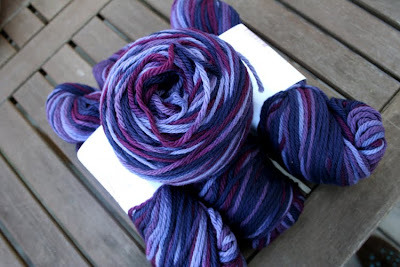 And Finn's sweater will be this superwash merino. These will be my first sweaters so I'm excited to see how they turn out! Last, but certainly not least, is this Christmas ornament that I was trying out. I haven't finished the mohair puff-ball for the top of the hat, but I think it turned out really adorable! Oh my Joy, you are a knitting genius as well! 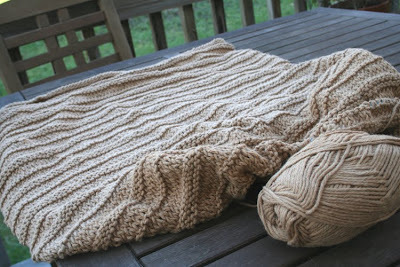 I love the blanket, feel like cozying up right in it and the yarn for the sweaters just looks too yummy for words! I love the yarn for Elizabeth's sweater! wow you are knitting up a storm! 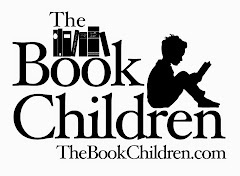 lucky kids! How do you knit so fast! Your family is going to have a wonderful Christmas with all that hand knit goodness. Such gorgeous yarn!!! 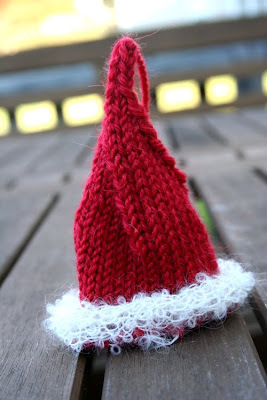 I love that knitted ornament! You are making me want to hit the yarn store on the way home tonight!!! I just love it all! your knitting is inspiring. the little hat is so cute. i look forward to more as your projects unfold. That little elephant down below is just the cutest! Love the yarn and colors for the sweater. I can't wait to see how it turns out. The ornament is sooooo cute Joy! Seriously, I say it time and time again.....your knitting amazes me! I'm starting to think that you don't ever sleep though.